Marsh, James H.. "Leonard Kelly". The Canadian Encyclopedia, 27 October 2014, Historica Canada. https://www.thecanadianencyclopedia.ca/en/article/leonard-kelly. Accessed 24 April 2019. Leonard "Red" Kelly, hockey player (born 9 July 1927 in Simcoe, ON). 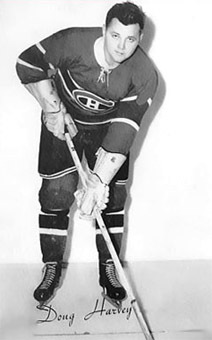 He was a star with the powerhouse St Michael's College junior teams of the 1940s and was one of the best defencemen in the NHL with Detroit, winning the James Norris Trophy in its first year (1953-54). Leonard "Red" Kelly, hockey player (born 9 July 1927 in Simcoe, ON). He was a star with the powerhouse St Michael's College junior teams of the 1940s and was one of the best defencemen in the NHL with Detroit, winning the James Norris Trophy in its first year (1953-54). In 1960 he was traded to the Toronto Maple Leafs, where as a centreman he was a key figure in four Stanley Cup victories. A smooth skater and effective playmaker, he scored 281 goals and 542 assists in regular season play, as well as 33 goals and 59 assists in playoffs. 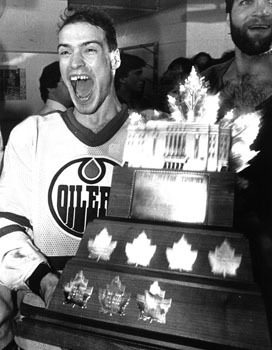 He won the Lady Byng Trophy four times. Kelly retired as a player in 1967 but continued a career in hockey as a coach, first with the Los Angeles Kings, then with the Pittsburgh Penguins and finally with the Leafs in the early-mid 1970s. Kelly's success as a coach led the Kings to two consecutive playoffs and the Leafs to four consecutive quarterfinal appearances. In honour of his achievements, he was named to the Hockey Hall of Fame in 1969 and received the Order of Canada in 2001. In 2006 the Leafs retired his number. On 3 October 2014, Canada Post issued a collection of stamps honouring six legendary NHL defencemen from the Original Six era (1942–67), including Kelly (the five others are Tim Horton, Pierre Pilote, Bobby Orr, Doug Harvey, and Harry Howell). While playing for Toronto Kelly also served two terms as an MP for the Liberal Party, from 1962 to 1965.